Dreams And Colour: Favourite Thing- "The Prairies"
I have mentioned more than once that I have a summer friend. I'm not sure if I've mentioned that, in the summer, he manages an antique store. I met him four summers ago when I went into the store, struck up a conversation and the rest is history. This is a modernist piece titled "The Prairies"- three nesting tables that can be displayed together or separately. 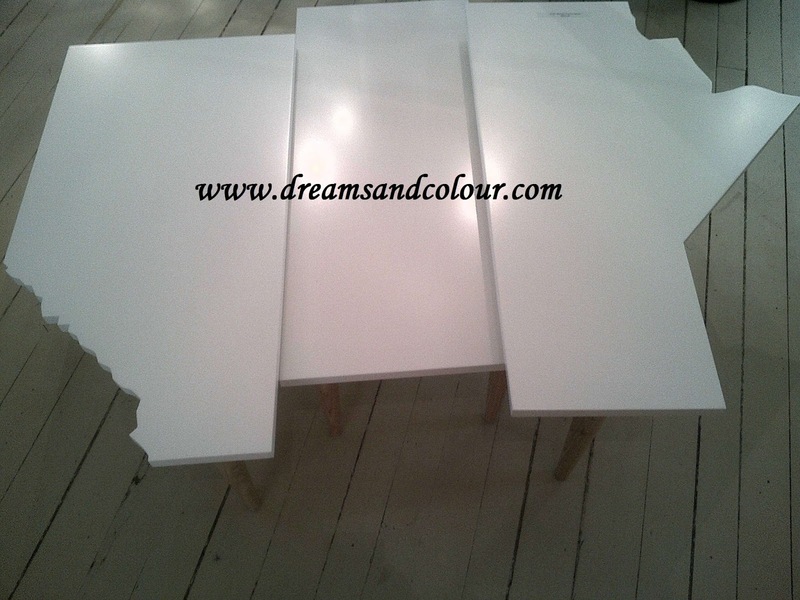 The tables, my favourite part and what made me fall in love with them, are Alberta, Saskatchewan and Manitoba! That's right, each section is designed to look like one of the Canadian Prairie Provinces! How great is that??? So he did, I did and we loaded it into my car. I'm now the owner of the above pictured table. While I LOVE this table...it was really expensive, even with a discount (thanks friend), it was still more than half my rent. Sure, I deserve to splurge and treat myself every once and again. But, in March I bought my wine bar, in May I bought a new car and in two weeks I'm going to Toronto to see The Wizard of Oz. I'm also not convinced that I have room for it in my apartment...why spend a ton of money on such a great piece that no one will ever see??? If I get it back to my apartment and I realize that I don't have room for it or that I no longer like it (or that I really can't afford it after all of my previous splurges), I do have the option of returning it. I say keep it! You've been thinking about it for a YEAR now! !